Non-professional (student or other) jazz groups tour Europe performing on the “Fringe Festival” stages organized by the major festivals to spotlight burgeoning talent. Audiences are large and enthusiastic. Festivals provide the stage and backline as well as other perks which include free tickets to major artist presentations, back-stage dinners where the major artists dine, official festival T-shirts, workshops, and jam sessions. Student performances are featured in all of the official festival publications, including the website. Cultural Tour Consultants handles all arrangements, including application to festivals. Jazz Festival Tours promote learning and education not only in music but history, geography, foreign language, art, architecture – a truly exceptional experience for students. 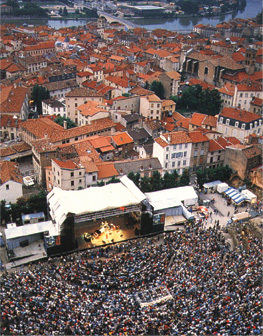 Most European jazz festivals take place during the summer months, primarily in July. Our most popular Jazz Festival Tour features the festivals of Montreux (Switzerland), Jazz à Vienne (near Lyon, France) and Jazz à Juan (French Riviera). Other major European Jazz Festivals, 2 to 4 of which can be combined in a Grand European Tour of 7-14 days are: Umbria Jazz (Italy), North Sea (The Netherlands), Vitoria-Gasteiz (Spain), Jazzaldia (Spain), and Istanbul (Turkey). In addition, there are a host of other lesser-known but very dynamic festivals in Spain and France. The possibilities are endless. For more information about Jazz Festival Tours to Europe and to receive a customized tour proposal, please contact Nancy Mettlen. Audition recordings (mp3 docs or CDs) must be submitted with a press package and the required deposit amount, to Cultural Tour Consultants no later than October 1 of the year preceding the festival. Upon receipt, CTC makes application to the festivals. Festivals generally announce acceptance less than 30 days after submission. (Umbria Jazz does not announce before February.) Deposit is refundable only if application denied by all festivals requested. Alternate (non-festival) performances will be arranged should application(s) be denied. Big Bands, Ensembles, and Combos – both vocal and instrumental – are eligible. Only non-professional groups will be considered. There is a minimum enrollment of 20 people to put together a tour, although smaller groups may be considered for one-festival tours. Should your performing group be comprised of fewer than 20 people, consider recruiting from your fan base to increase numbers. All members of the traveling group take advantage of benefits offered by the festivals (with a few exceptions): back stage dinners, free or reduced-price tickets to major artist performances, etc.